Our outdoor A/C covers have always been some of our most popular items. Since we know people need to keep their A/C's protected, it only made sense to introduce a line of Indoor Air Conditioner Covers. Since they're designed for indoor use rather than out, these covers are made of quilted polyester fabric with a diamond stitch pattern. 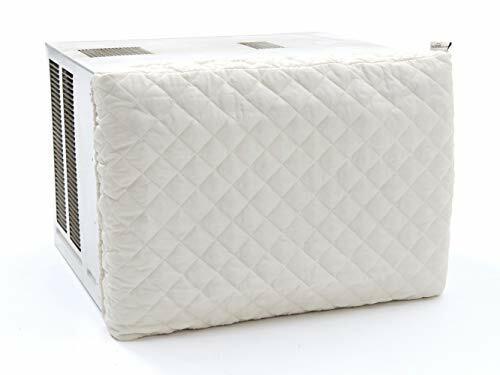 They can be used with window mounted or through the wall air conditioners and are great at preventing dust, dirt, and other small debris from clogging up you're A/C unit when it's not in use. A fitted elastic band helps keep the cover on tight and the polyester material is very easy to clean - just give it a spot cleaning as needed or run it through your washing machine on a gentle cycle. An indoor A/C may have it easier than an outdoor, but it still needs to be properly protected to ensure a long life. Cover yours with our Indoor Air Conditioner Covers and it'll be running strong for years to come! SIZE: This cover is designed to fit Indoor Air Conditioners with dimensions up to 25W x 2.5D x 18H at full stretch. Using this cover on slightly larger Indoor AC units may result in an improper fit.